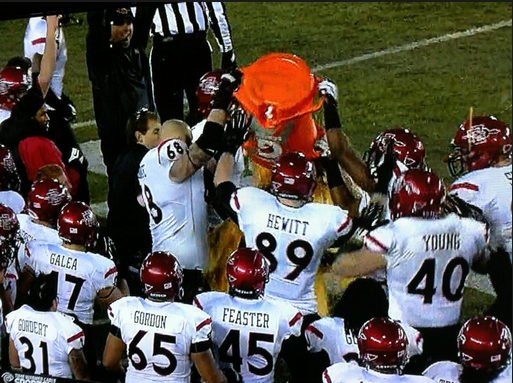 San Diego State University is entering the 2013 Mountain West Conference Football Season with a target on their backs. One of the three defending MWC champions San Diego State will be looking to duplicate their MWC title performance from the 2012 season. Throughout the summer we are going to be providing you all with in-depth player profiles for those who we believe will be key for the Aztecs repeat. We will also be posting position profiles to keep everyone informed on the depth charts. We will be posting all of the articles that we write on San Diego State Football to this page. We will also post other links that we find important to enriching your knowledge about the upcoming San Diego State Football season. Photo Credit: CEO David Frerker photo taken at the San Diego State vs. Air Force game. Jake Fely has been named the top linebacker in the Mountain West Conference for the upcoming 2013 season (Mountain West Conference Official Website). First Team: Jr, running back Adam Muema, Jr. linebacker Jake Fely and Sr. safety Nat Berhe. Second Team: Jr.defensive lineman Sam Meredith, Sr. linebacker Nick Tenhaeff and Sr. kick returner Colin Lockett. Third Team: Sr. offensive tackle Bryce Quigley, Jr. linebacker Derek Largent and Sr safety Eric Pinkins. Fourth Team: Sr. wide receiver Colin Lockett and Sr. punt returner Tim Vizzi.